The family run business was originally founded by Dave Mills in 1979 who started the business from scratch building a clientele up for years before getting himself on his feet and eventually running a successful company. Jon Mills, David’s son started with the company after leaving school in 2009 and was keen to push the business forward and develop the company’s framework. With expansion in the business, we now employ a small team of highly skilled operatives who are trained to deal with any circumstances. All our staff are highly trained and have all the necessary qualifications including City and Guilds High-Pressure Water Jetting, Confined Space Entry, Construction Skills Certificate Scheme. Our diverse fleet of vehicles are specially designed to deal with any drainage issues a customer may have. Our specialist team will make sure we utilize the correct vehicle for the job ensuring a fast and efficient service is provided. Our modern diverse fleets of tankers are capable of undertaking any task thrown at them. Our bespoke JHL Recyclers are 95% more efficient than any standard jet/vac tanker. The full dirty water Recyclers, remove the dirty water from the drain, cleaning and filtering the water to re-use as jetting water saving up to 15,000 litres per 10-hour shift. Further giving our customers more time on site reducing downtime and water filling time during the course of the project. All of our tankers are fully equipped with a comprehensive range of nozzles to suit almost any application. Our dedicated team will ensure the right vehicle is applied to ensure the project is completed smoothly and efficiently. Our modern van pack jetters are specially designed for the smaller scale operations from domestic drain cleaning and root cutting to small factory cleans. Pipe sizes from 100mm-325mm operating up to 4000psi, our van pack jetters carry a comprehensive range of nozzles from root cutters to spinning hard water scale removers. Our vehicles carry an onboard water tank which Is ideal for property’s which do not have an external water source. Our mainline CCTV van is used for the surveying of any drainage pipes varying from 100mm-2000mm Dia. 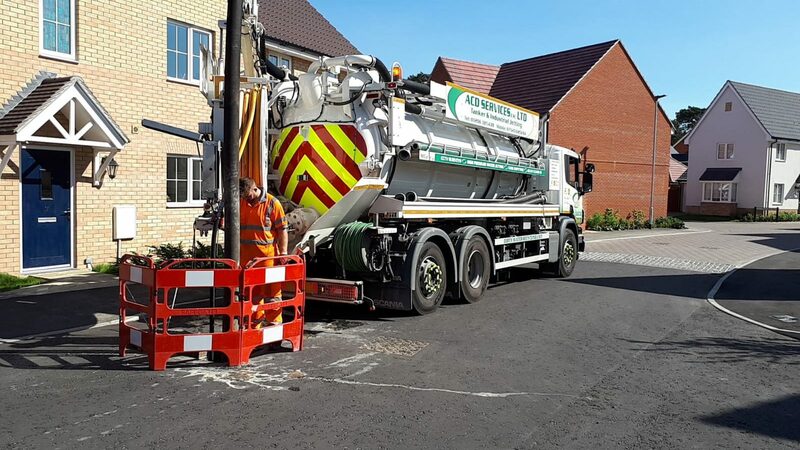 Whether this is for a small domestic house or a large-scale Highway adoption scheme our CCTV team will be sure to provide you with all the necessary information on your underground pipeline assets. With capabilities of surveying 100mm-2000m dia and up to 250 meters in length. Our reports will provide you with size, length, construction, direction, flow and structural condition. Our service vehicles are fully equipped with all necessary service parts whether it is for Sewage Treatments Plants, Pump stations, Air blowers, Submersible Pumps, Mono Pumps, Electrical panels. Our experienced engineers can swiftly and efficiently test, repair and replace parts if necessary to ensure your apparatus can operate with complete peace of mind. We can offer full-service schedules to run alongside periodic emptying and cleaning of your septic tanks and sewage treatment plants.